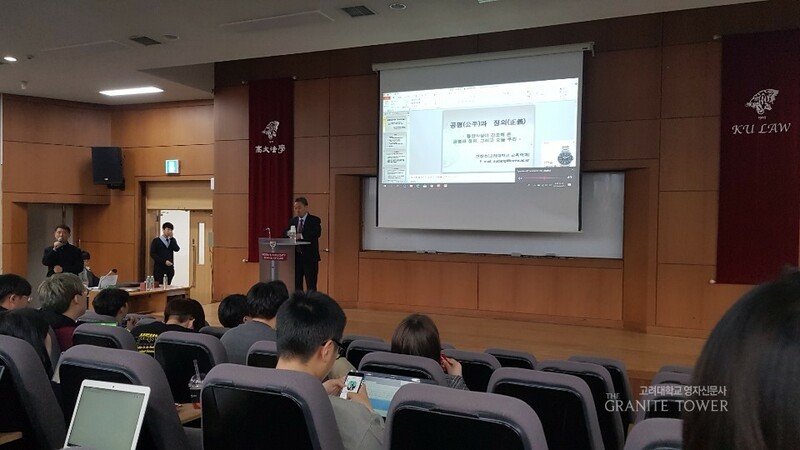 On April 3, a public lecture by Professor Shin Chang-ho (Department of Education) was held at the College of Law. The lecture mainly focused on two main topics: justice, and fairness. Throughout the lecture, Professor Shin talked about how the two philosophical, somewhat abstract terms could be blended into the current society. Professor Shin started the lecture by discussing the meaning of democracy and the people living in it. He stated that the democratic society itself pursues justice and fairness, and that people should work together as groups to bring about meaningful changes to the world, rather than individually working to satisfy one’s personal needs. After the discussion, Professor Shin introduced the ancient philosophers and their books such as “The Analects of Confucius” and “Mencius,” and expounded on how these theories could be blended into the current society. Just as the ancient philosophers assert, Professor Shin argued that people should try to become a man of virtue, and care for others instead of only securing personal profits without any contribution to the society. After the lecture, Professor Shin was received some questions. The questions mainly dealt with the students’ doubts on whether the ancient philosophies about the society could actually be applied to the current society, since the two eras are greatly distant in time. As a response to such inquiries, Professor Shin stressed that the main goal of the society does not change, and the old customs of taking care of others should continue.